Fentanyl is a synthetic opiate. Synthesized in 1960 by the Belgian doctor Paul Janssen it was first used intravenously to calm severe pains as those produced by cancers in advanced phase because it is a powerful analgesic and sedative. It is 50 to 100 times more potent than morphine and hundreds of times more powerful than heroin, it is now administered as patches or lozenges. It depresses the central nervous system and respiratory functions, it does not cause loss of consciousness but it can be lethal by respiratory depression. The singer Prince died in 2016 of an overdose of fentanyl. A very close compound, carfentanyl is 30 to 100 times more effective than fentanyl. As soon as the powder form appeared it was used as a relaxing and euphoric drug but it is highly addictive. In addition, its power is such that a few grains of powder can kill the user before the injection is completed. The lethal dose in humans is estimated to be between 1 and 2 mg. According to the US agency DEA, fentanyl is mass produced by illegal laboratories in China before being resold to Mexican cartels. It is then sold by conventional networks of opiate drugs. In 2016, an Associated Press investigation showed that 12 Chinese companies resell carfentanyl online without any verification of its use. In the US, the number of overdose deaths involving synthetic opiates other than methadone increased by 72% from 2014 to 2015 with 9,500 deaths that year. Seizures of fentanyl increased seven-fold between 2012 and 2014, with 4,585 in the United States in 2014. In 2016, there were 1,000 to 2,000 deaths in Canada. Fentanyl is considered an incapacitating agent. It was used by the Russian Federal Security Service (FSB) in 2002 to release the 850 hostages held by a Chechen group in the Doubrovka theater in Moscow (North-Ost siege). The gas (remifentanyl, a derivative less powerful than fentanyl) has been spread in the room by air conditioning systems. There were 130 deaths, the amount of gas administered having been overestimated. Some publications report the use of carfentanyl. It appears that this gas has been the subject of a large number of tests as a chemical weapon by several armies. The expected effect is to neutralize the enemy without killing him. The United States tested the effect of aerosolized carfentanyl on primates. The Chinese army used « narcosis » weapons containing an incapacitating fluid. They have also published scientific publications on the subject. Israel admits to having carried out several operations with this product: the country is even suspected of having tried to assassinate Hamas leader Khaled Mashaal in 1997 by using a miniaturized gas cartridge. This odorless gas can be released into the indoor or outdoor air as fine particles or aerosols. It can contaminate water, food and even agricultural products (aerosols). Pathways to the body are the lungs by inhalation, the digestive system by ingestion, or dermal. It can also be administered intravenously, intramuscularly or intradermally (patch). An Ohio policeman who was arresting a drug trafficker received white powder on his shirt and wiped it with his bare hand. A few minutes later he collapsed; he was treated with nalaxone and healed. A fortnight later, a policeman from Pennsylvania was hospitalized after inhaling powder under identical circumstances. Delays of action are different depending on the routes of penetration. Intravenously the action is very rapid : a few minutes after the injection of a single dose of 100 micrograms, the analgesia appears and lasts about 30 to 60 minutes. Dermal absorption is slower, from a few hours to a few days. However it depends on the products, the carfentanyl penetrating faster than fentanyl. Orally, there are two phases: the initial exposure occurs very quickly in a few minutes, whereas the intestinal absorption takes place only after 2 hours. Pulmonary absorption is very rapid. In all cases, the toxicity of fentanyl in powder form, by inhalation and dermal contact is not clearly established and is still the subject of debates. The person has great difficulty breathing. It may have only 3 or 4 breaths per minute. This slow breathing can continue for 30 to 40 minutes. Oxygen is no longer properly distributed to the brain or heart (hypoxia). The level of carbon dioxide increases in the blood. The chest muscles contract to prevent breathing. Cell death can involve the brain and / or the heart. The antidote to morphomimetics is Narcan (R) (nalaxone), antidote to morphomimetics. It displaces morphine from its bulbar receptor sites and stops its action. Generally administered by the venous route, it may also be in the form of a nasal spray. Since opioid receptors are found throughout the brain, the sequelae are very varied and can be permanent. These substances are potentially dangerous to first responders who may come into contact with them without knowing it. They may be powders, tablets or liquid forms. They may be exposed by inhalation, contact with the mucous membranes, oral route or even percutaneous (sting). These contacts can quickly lead to fatal respiratory distress. Contact with the skin is not expected to lead to overdose unless it is done with a very large amount of highly concentrated powder and over a long period of contact. 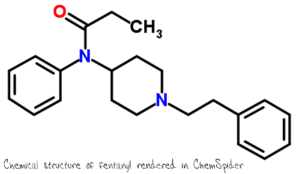 Brief contact with fentanyl or its analogues generally does not give rise to toxic effects especially if the visible contaminant is rapidly removed by transfer. In case of suspicion, the wearing of personal protective equipment is obligatory: no contact with skin, mucous membranes and respiratory system is allowed. OUVRY’s PPE are perfectly adapted to this type of situation. The services concerned are emergency doctors, firefighters, law enforcement agencies, forensic investigative police, special forces. In all cases, fentanyl and its derivatives must be destroyed. It has been shown that degradations by oxidizing agents are generally effective: trichloroisocyanuric acid, SPC / TAED (sodium percarbonate / N, N, N, N-tetraacetylenediamine and peracetic acid and hypochlorite solutions being the products leading to the most complete degradation (L.Qi et al.) Degradation and appearance of by-products is monitored by GC / MS and / or LC / MS.
At the « 2 nd international conference CBRNE – Research & Innovation » in Lyon (France) on 29, 30, 31 May and 1 June 2017 was presented by L. Cochrane the G. Little, a poster studying the capabilities of degradation of the Reactive Skin Decontamination Lotion Kit RSDL on fentanyl. You can find the poster by following this link. This product is intended to remove and neutralize chemical warfare agents and T-2 toxin from the skin. The experiments were conducted according to NATO STANAG 4360 with concentrations of 250 micrograms of fentanyl per sample (3 samples tested). The degradation reaction was monitored by LC-MS. After 2 minutes of contact, the percentage of remaining fentanyl was 0.14% for decontamination of 99.86%. These results are quite preliminary: kinetic reactions are under study and the clinical significance of such a result is still unknown. Our most recent studies also show that DesDec R2D4 is able to remove 97% of a 10 microgram concentration of fentanyl (followed by GC / MS and LC / MS) after a 5 minute contact. Other tests are currently underway to confirm these results. In the current context of terrorist threat, the chemical weapon represented by fentanyl must be taken seriously. First responders are aware of the real danger of such a molecule and are training to control this new risk by means of the PPE and the appropriate means of decontamination.